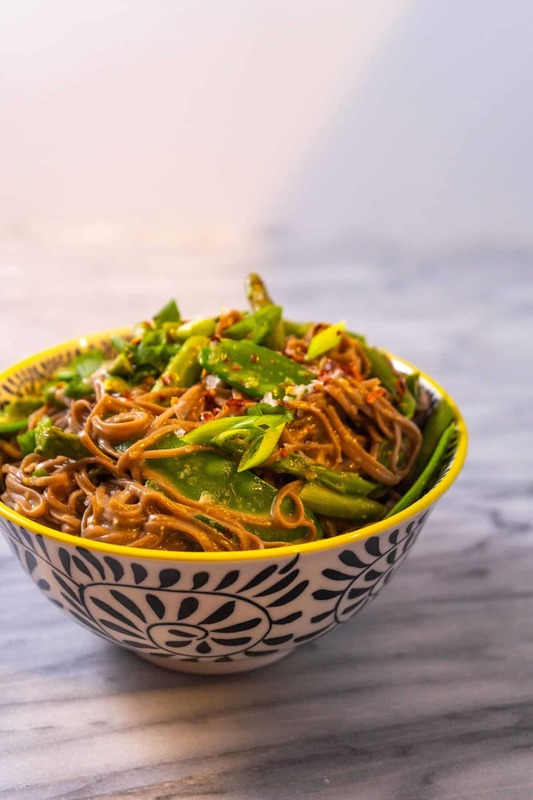 For when you need a filling, veggie-packed dinner in 15 minutes flat… or a side for a dinner party, these Miso-Butter Soba Noodles with Asparagus and Snow Peas have your back! The sauce of these Miso-Butter Soba Noodles, made up primarily of (shocker!) white miso and unsalted butter is crazy luscious. I know… a weird word when it comes to food, but in this case, it’s entirely true! Then comes the one-two punch of the fresh garlic and ginger that just takes it over the top. The noodles are cooked with the veggies, then poured over the mashed miso-butter combo to soften it down. 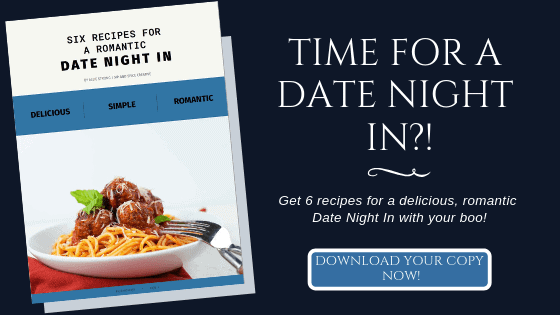 So you end up with minimal dishes and maximum flavor! 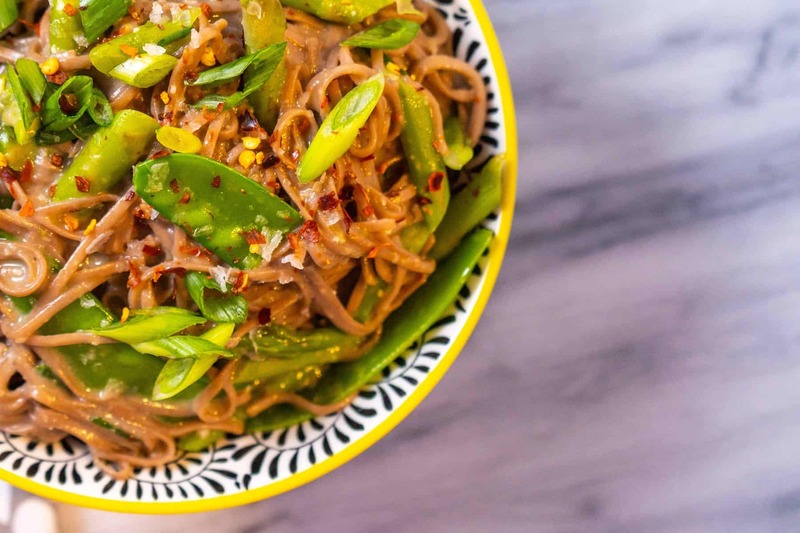 I love the crunchiness of the blanched asparagus and snow peas in this noodle dish. If you’re not feeling asparagus and/or snow peas (or they aren’t looking great at the store), feel free to swap in any veggies you like! Shredded carrots, peppers, broccoli or bok choy all sound delicious. 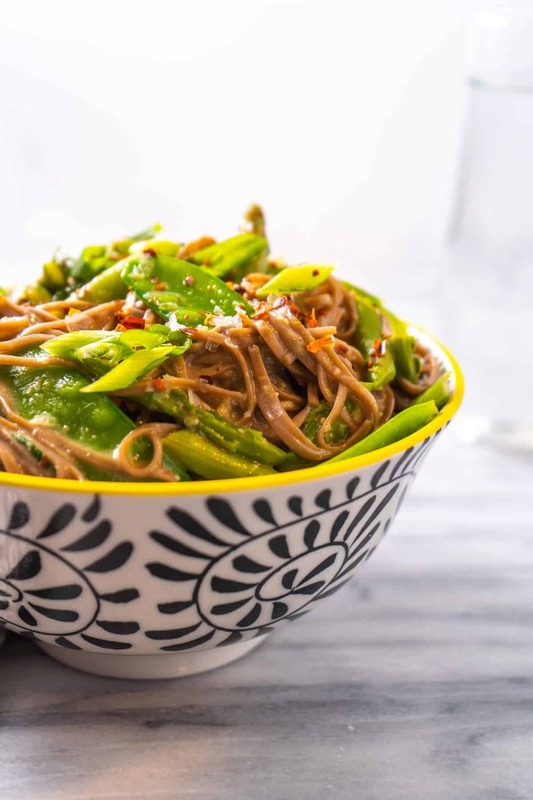 I would happily eat these Miso-Butter Soba Noodles as a main dish as a quick weeknight dinner, but if you’re hungry, you could amp it up with some saute chicken or tofu. Or serve it on the side of a main dish. They can be served warm, room temperature or cold. Trim the asparagus and cut to 1-inch pieces. In a medium bowl, add the butter, miso, ginger, garlic and salt. Mash well with a fork and set aside. Bring a pot of water to a boil. Add in the soba noodles and asparagus and cook for 1 minute. Toss in the snow peas and cook for another 2 minutes. Reserve 1/4 cup of pasta water, then drain the noodles and vegetables. Pour the hot noodles to the bowl with the miso and let sit for 1 minute. Add in the sesame oil, red pepper flakes and scallions. Toss with tongs or a fork. If additional liquid is needed, add in some of the reserved cooking water a couple tablespoons at a time.